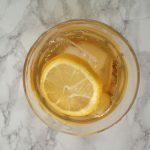 A few weeks ago, my good friend Lorna, from Wilson’s Workouts asked me to write a post for her blog about kombucha. I love that she asked me to do this as our friendship sort of evolved around kombucha! 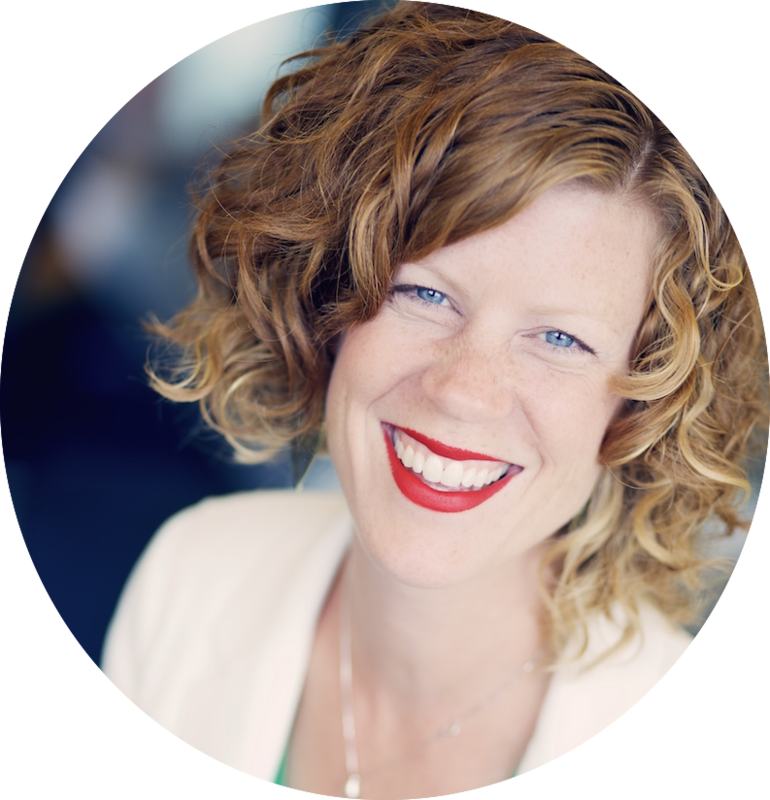 When I first arrived in Amsterdam years ago, I joined a Dutch class straight away and Lorna was in my class. We lost touch, but I met her again through a mutual friend. I was investigating all things fermented at the time and found out that Lorna was making kombucha. She gave me my first SCOBY. I would like to say that it was love at first sight…with the SCOBY I mean. I made the kombucha according to instructions, but was AFRAID to drink it. We laugh at it now, but it’s really true. Maybe some of you feel that way too. A little while later, I got another SCOBY from Lorna and this time I was determined. I knew how good fermented foods were for you (you can read about it on the post I wrote for Wilson’s Workouts). This time I was going to try it…WOW, I loved it! When you serve a refreshing, sparkling kombucha over ice to your loved ones, knowing the benefits and knowing you made it (with the help of our dear SCOBY) it’s a GREAT feeling. It’s seriously tasty! Metal corrodes. Let’s face it, fermenting creates acid…okay, it’s lovely tasting acid, but it will make your kombucha taste really weird! Don’t use it. Show love to your SCOBY. 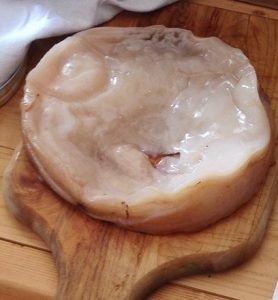 It’s normally happy just to do it’s thing, but if you put your SCOBY in the sun, it’s gonna cry. Okay, not literally. If it’s too hot or too cold, it’s going to be grumpy like Goldilocks. It likes it just right. You need to experiment for yourself. Sorry, this might be scary, I know. The thing is, your SCOBY is a living thing and it gets moody if the conditions aren’t right (remember Goldilocks?!). That means that you should have a little taste of the tea as it ferments. You’ll find the sweet spot…I don’t mean sugary sweet, ’cause that’s not good, but the point that perfectly meets your tastes. In the beginning your kombucha will be sweet, because it’s still tea silly! If you let it ferment too far then it will become vinegar – damn tasty vinegar, perfect for salads I might add (so don’t throw it out). You’ll find it, but only by tasting. Get your sweet spot. That sweet spot will change over time, I promise. I’m more on the vinegary end now. You’re going on holiday and don’t want to come home to a huge batch of vinegar? No problem! When I said before that kombucha likes it ‘just right’, it doesn’t mean that it will die if it’s too cold. No! It just means that the fermenting process will s-l-o-w right down. So pop that baby in the fridge where it’s nice and dark and cool and enjoy yourself! I usually make sure my bottled kombucha is finished and don’t start a batch until after my holiday. Just remember to keep that SCOBY in a blanket of kombucha so it doesn’t dry out. Then you can use that kombucha to make your next batch. Easy! No kidding. I’ve read books, fermenting sites and played around and I really like this version I made. Let me know in the comments below what you think! 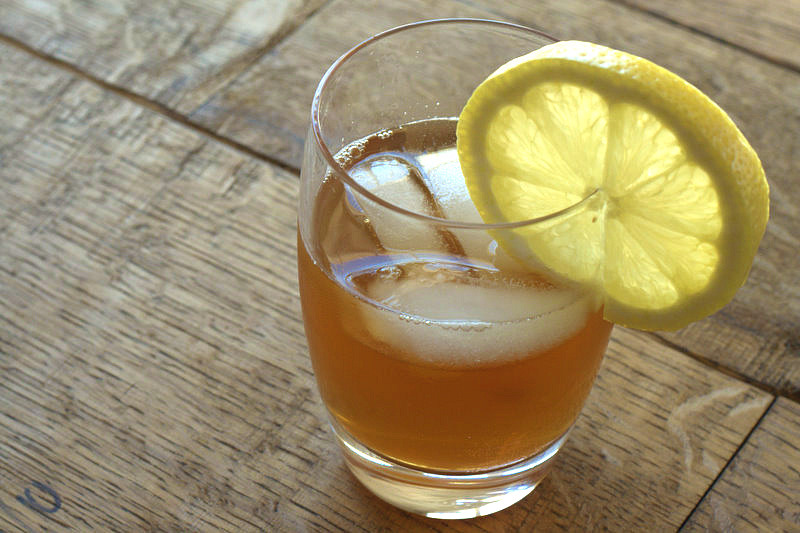 Is it the best kombucha recipe or what?! 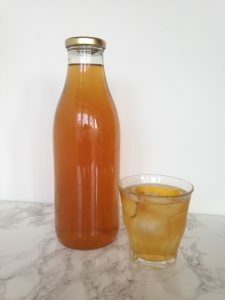 If you want to know how to really jazz it up then sign up for my newsletter and I’ll let you know when I post about ‘Second Kombucha Ferment’. Y-U-M! I usually make 3L at a time, but for you beginners, here it is for 1L. Boil the water and make the tea with the sugar. Take the bags out after 15 minutes and allow the tea to cool overnight (it takes ages and better safe than sorry – see above). Sterilise your jar either with boiling water swished around and thrown out or in a preheated oven for a few minutes. Allow to cool before pouring the tea in there. Then you can add your SCOBY and the kombucha. I usually pour it gently in, or use a large plastic spoon. Put a cheese cloth (I use a tea towel actually) tightly over the mouth of the jar and seal it with an elastic band or a string. Let it sit like that on a shelf next to your books or anywhere out of the sun and don’t forget…test it every day in the beginning so you find your sweet spot. Just a tiny spoonful. When it’s ready, you can take most of the kombucha out and bottle it. This should be in a sealed bottle/jar (to keep that yummy carbonated goodness in) in the fridge. 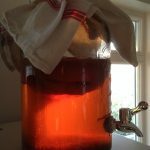 Be sure to leave enough kombucha with the SCOBY for your next batch or to keep it wet if you’re hibernating it (see above pt 4). You are now officially a Kombucha Enthusiast. Well, okay, maybe not yet, but try a couple of batches and you’ll see! Let me know how you get on, I love hearing your kombucha stories! *Where do you get a SCOBY? Ask a friend, colleague or your local Nutritional Therapist (I sometimes have extras so just ask). In the spirit of fermenting, they are usually free, but you can also order them online. Thanks for the scoby… first batch is a huge success! Glad it worked out Kelsey! Next stop you should try a second ferment…it really adds delicious flavour to it. I’m interested in making Kombucha by myself rather then buying everyday from the supermarkets. I wonder where I can buy the the Scoby and a cup of Kombucha?